Food lovers and families are in for a treat this spring as Bishop Auckland gets ready to host its fabulous food festival once again, on Saturday 1 and Sunday 2 April. This popular festival draws visitors from across the North of England, who come to buy from the wide array of stalls, take part in masterclasses and enjoy a host of entertainment across the weekend. Now in its 14th year, Bishop Auckland Food Festival continues to bring the very best food and drink producers and suppliers together along with some of the country’s leading culinary talents for cookery masterclasses and demonstrations. This year sees the return of Tom and Henry Herbert from The Hobbs House Bakery, best known as stars of Channel 4’s Fabulous Baker Brothers. On Saturday 1 April they will be entertaining the crowds in the Newgate Centre, where they will be teaching onlookers how to make soda bread from scratch for the ultimate sandwich and ‘posh kebabs’ starting with sumptuous soft flat breads filled with local lamb..
On Sunday 2 April, the fabulous Foxy is back guiding audience members at Bishop Auckland Town Hall through the creation of some delicious dishes, including one inspired by his new place of residence – Spain! Richard Fox is a seasoned TV chef, cookery book writer and demo expert, and a regular face at BAFF. He has chosen some of his favourite dishes to share with you, including sushi, tapas and gnocchi. 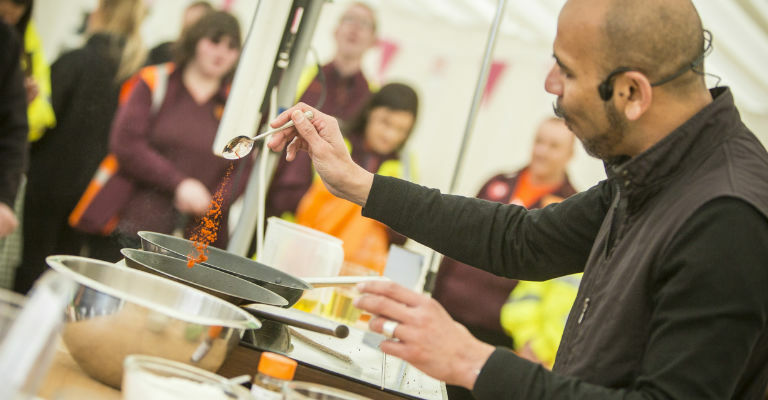 The Urban Rajah’s Pop-up Café is also back as festival favourite, Ivor Peters (aka The Urban Rajah) will once again be working with students and staff from Bishop Auckland College to create the ultimate Indian dining experience. For one weekend only, the team will be taking over the café in Bishop Auckland Town Hall to bring you ‘The Pav’ – a fast food dish from Mumbai with spiced fillings, such as potato cutlets, minced lamb or toasted paneer, ladled with a spiced salsa and served in a soft buttered bread roll. Young foodies can also try their hand at a range of culinary techniques at the Children’s Cookery School running in the Newgate Centre with classes ranging from bread to pizza making, scones to fizzy cocktail concoctions! Entertainment is plentiful across the weekend with bands from Durham’s BRASS festival performing in ‘The Bish and Hop’ – a Bavarian-style Bier Keller being installed in an empty shop on Newgate Street. Comedy fans are also in for a treat with a stand-up comedy night, The Big Comedy Feast, which takes place at Bishop Auckland Town Hall on Saturday 1 April at 7.30pm. Full details and tickets for all these events can be found online at www.bishopaucklandfoodfestival.co.uk Tickets can also be purchased from the Gala Theatre in Durham on 03000 266 600 or in person or from Bishop Auckland Town Hall on 03000 269 524 or in person.